Any politician worth his salt should also have seen Kevin Rafferty and James Ridgeway’s 1992 documentary, Feed. Seventy-six minutes of the year’s Presidential aspirants caught on camera muttering inanities, losing their temper, and generally having less than dignified moments while they were standing before the cameras but somehow allowed themselves to believe that, the presence of the cameras and microphones notwithstanding, their private moments would remain private and that the public at large would never view their raw moments and coarse humanity. He’s clearly a slow learner, so it shouldn’t have come as much of a surprise today when it was disclosed that, awaiting his appearence on FOXNews this weekend, talking smack about Senator Obama. 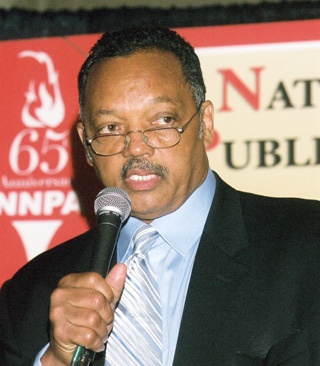 Jackson was waiting for his appearance with UnitedHealth Group executive Dr. Reed V. Tuckson, when he said, “See Barack been, um, talking down to black people, on this faith-based…I want to cut his nuts off.” He punctuated his statement with a bite of his lower lip and a slashing upward gesture as evidenced by the lurch in his right shoulder. He’s a very slow learner, apparently, as he thought that whispering his comment afforded him some privacy. Reverend Jackson is apologizing for what was, again, “a private moment.” In other words, he’s apologizing for being caught. There probably won’t be much that will come of this little dustup, but glimpses of Jackson’s private side have belied his public persona. In that he’s not much more different than a number of politicians, if only a little more craven. In any case, “I want to cut his nuts off” doesn’t do much to feed the “up with hope” message. And, for the last time, Reverend, there’s no such thing as a dead mic.